Are the BS and the DS in BDS manifestations of a malodorous whole? If we leave analogies of bull and donkey excrement aside, is there any way to intellectually or morally justify the Arab inspired BDS campaign? Or is the BDS campaign, co-founded by Omar Barghouti, yet another example of how Muslim racist supremacism fails when interrogated by the standard trifecta of intellectual rigour, universal morality and international law? But is that so? Is Israel an apartheid state as set out in Article II of the UNGA declaration introduced in 1973 and eventually ratified in 1976 by over 100 countries? In this she is mostly correct. However, she omits to mention that in addition to Israel and the United States, Canada, France, Germany, Italy, the Netherlands, the United Kingdom, Australia and New Zealand, “to their shame”, also refused to sign on or ratify the International Convention on the Suppression and Punishment of the Crime of Apartheid (ICSPCA). These democracies rejected the ICSPCA formulation that apartheid was declared to be a crime against humanity because crimes against humanity are considered so grave in nature that they must be meticulously elaborated and strictly construed under existing international law. For anybody who has lived in Israel, Article II, as it would be applied to the Jewish State by Israel’s detractors, is to draw a very long bow. Learned treatises have been written refuting every one of the apartheid allegations at every level that Israel’s detractors would bestow on her. I will not add to the painstaking and methodical work of my betters. For those who haven’t lived in Israel, why would they believe somebody like Barghouti unless it suited them to subscribe to a prejudice and a libellous bigotry that meshed with their own personal world view? It is easy to show Barghouti for what he is. 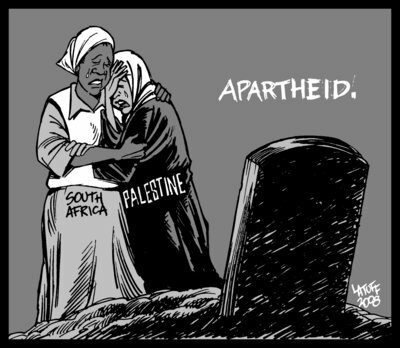 By that I mean that labelling Israel as an apartheid state comparable with the old South Africa is the most potent weapon in the armoury of BDS promoters. It resonates well with those who live by popular media ‘sound-bite analysis’ of complex situations, and Barghouti has chosen his weapon well. While well-intentioned, though not necessarily well-read, people believe the BDS movement is worthy of support because they mistakenly believe that BDS advocates a two state solution, the truth is quite different. Dem’s fighting words in anybody’s language. And the written record can never be erased. Unfortunately, those sentiments from the horse’s mouth [apologies, Omar…] lay bare the real aim of the BDS campaign. The intellectuals [sic] behind the BDS campaign do not support a two-state solution as most European and some Australian BDSers believe. They support a one-state solution where 7.7 million “Palestinians” worldwide would return to present-day Israel in an act of “euthanasia” [apologies, Omar] that would spell its demise. The barely-concealed bigotry and prejudice that drives the international BDS campaign is slowly coming under greater examination across the western civilised world which values intellectual and moral honesty. Here again, Mr Barghouti does the movement no favours. For example, Mr Barghouti maintains that BDS follows the heroic legacy of Martin Luther King Jr., Nelson Mandela and the anti-apartheid movement, where being anti-Israel aligns you with the romantic, heroic social justice movements of the past. As for that other icon, Nelson Mandela, and the narrative of C.R.A.P. that the BDSers would have you believe, we have only to turn to the 1990 series of interviews that Mandela gave on his invitation to the United States for a series of ticker-tape parades celebrating his achievement: With respect to Israel and the Palestinians, Mandela stressed that he unequivocally recognized Israel, not only as a de facto entity but its de jure right to exist as a state behind secure borders. But this is not about whether Mandela gives Israel a character reference or not. Omar Barghouti and his BDS campaign are currently a popular go-to mainspring for those leisured but morally and intellectually suspect classes looking for a cause to espouse. At his core, Barghouti is essentially dishonest; his campaign is based on a lie. Hence, BDS will go the way of other ill-conceived Arab plans since 1948 to rid the Middle East of the only Jewish state in the world. In support of the above claim, I state that Mr. Barghouti claims that it is racist for Israelis not to condemn their army when it accidentally brings about the death of Palestinian civilians while in his view it is not racist for Palestinians publicly to applaud the purposeful murder of Jewish children or kidnapping of Jewish teenagers. Further, Omar Barghouti does not deny the tacit assumption that while Palestinian nationalism is a legitimate expression of the national aspirations of the Palestinian people, Jewish nationalism must be racism. For Mr Barghouti to appeal to a wider base of a readership not well versed in Middle east history, facts and figures, he must needs use the race card to justify his claim that Israel pursues a policy of apartheid. If you have never been to Israel you would never know otherwise. Mr Barghouti banks on this. Mr Barghouti could not deny that if you had ever been to Israel or lived there, you would know that in Haifa or Tel Aviv or Jerusalem, Jews and Arabs live in the same neighborhoods, in the same blocks of flats In Jaffa, Lod and Haifa, frequent each other’s businesses, and cheer the home town football team together. Israeli Arabs have the right to vote, serve in the Knesset, study in Israeli universities, share the same hospitals and public facilities and work alongside Israeli Jews. If you fell ill you would likely be looked after by Arab physicians and nurses in Israeli hospitals. Eleven serving members of the current Israeli Parliament in the State of Israel are Arabs, even though they don’t (yet??) see the irony in their vociferous objection (Ahmed Tibi, MK, February, 2014) to living under the Palestinian Authority in any future two-state solution…….. Casting “Palestinians” as passive ‘victims’, wholly innocent of any responsibility for their plight, Mr Barghouti essentially disrespects them by absolving them of any accountability for their own actions, and providing them with a framework to behave as if they can do no wrong. “The only reason there is no Palestinian state thriving next to Israel (to which Palestinians the world over would have the right of return) is because the Palestinians do not want such a state: they would rather destroy Israel than build Palestine – and often well-meaning Europeans [and Americans] encourage them in that idee fixe” ( (Menachem Kellner, 2007). Thus, even this brief survey highlights the questionable intellectual and moral honesty of this mainstay of rational Arab policy. As for Ms Makdisi who lives and works at UCLA, well, I bear her no ill will. When all is said and done, Ms Makdisi, is a professor of literature, and the very tools of her trade are, after all, mostly fiction. This entry was posted in Israel and tagged apartheid, Barghouti, BDS, bigotry, ICSPCA, Israel, Mandela, one-state solution, Palestinians, prejudice, refugees, right of return, South Africa, tw-state solution, UNGA on June 14, 2014 by Alan in Australia. Alan– when you tweet out your posts, use the full URL ie https://salveveritas.wordpress.com/2014/06/14/are-the-bs-and-the-ds-in-bds-symptomatic-of-a-malodorous-whole/ rather than just the title of the blog. Twitter will shorten the URL for you or you can use tinyurl.com. Otherwise you lose the reference to the specific post.